Before writing this article, I went back to an old article from 2015. In 2015, I had written, Plectosporium blight was more severe than normal. In 2018, I have also observed more Plectosporium blight than usual. It is not clear to me why this disease seems to be more widespread compared to recent seasons. However, it makes sense to review Plectosporium blight here. Figure 1. 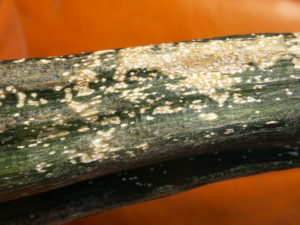 Plectosporium blight can cause spindle shaped lesions on the stems of pumpkins. Figure 2. Plectosporium blight may cause fruit quality loss due to lesions on handles. Figure 3. Plectosporium lesions on pumpkin fruit are less common. Lesions on leaves may be dimple like. Lesions may also occur on the fruit (Figure 3), although these symptoms are less common. 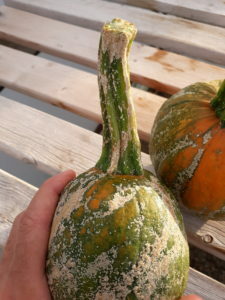 Yield loss is most often caused by lesions on the stem adjacent to the fruit—the pumpkin handle (botanically known as the peduncle). Yellow squash and zucchini squash are also affected. When lesions occur in large numbers they can give a light gray or white appearance to the foliage. 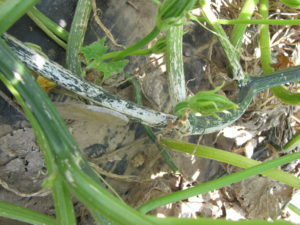 Usually, the lesions affect only the appearance of the foliage or fruit. Infrequently, the lesions can become so severe on young plants that individual leaves or vines may wilt. This disease may be managed through a combination of cultural and fungicide treatments. Crop rotations of 3-4 years and fall tillage will help keep the crop residue to a minimum. A regular contact fungicide program will also help to keep Plectosporium blight in check. My fungicide schedule purdue.ag/pumpkinfs (https://ag.purdue.edu/arge/swpap/Documents/fungicide%20Schedule%20pumpkin%20Updated%20March%202018.pdf) for pumpkins lists the systemic fungicides Cabrio®, Inspire Super®, Merivon® and Quadris®/Satori®.